HA NOI (VNS) — The Viet Nam Real Estate Association (VNREA) will establish a brokerage branch to support, represent and protect the rights and interests of organisations and businesses dealing with real estate brokerage. The branch was introduced at the VNREA annual meeting in the central port city of Da Nang recently. Head of the Construction Ministry's Housing and Property Market Department Nguyen Manh Ha accepted his posting as the branch's chairman. All brokerage businesses, exchange floors and individuals who have received brokerage certification are welcome to take part in the association. The branch is expected to be a channel for receiving complaints and for the contribution of ideas from organisations and individuals on the State's policies on real estate. According to VNREA's General Secretary Tran Ngoc Quang, the association has more than 1,580 members nationwide. Some 30,000 people nationwide have been granted real estate brokerage and assessment certification. At the meeting, Tran Kim Chung from the Central Institute for Economic Management presented three scenarios for the domestic market, saying it was standing at a three-way crossroads, reported news website dddn.com.vn. The first scenario is that the market will continue to remain stable with a small potential for development, as is currently the case. This is the most likely scenario. The second scenario is that the market will begin a new growth cycle. This may occur if a number of factors come together: The situation in the East Sea must become stable; Viet Nam must successfully participate in the Trans-Pacific Partnership (the country's economy is expected to increase by 10 per cent if this becomes a reality); the State must remain a macro economy with stable monetary policies; and revised laws affecting the construction and real estate business must be passed, which will further open the door for Vietnamese living abroad and foreigners to buy a house and own real estate in Viet Nam. The third scenario is that the market will see a downturn if the situation in the East Sea worsens and the country's macro economy declines. Based on the above analysis, Chung said the domestic real estate market showed signs of development in the next few years. 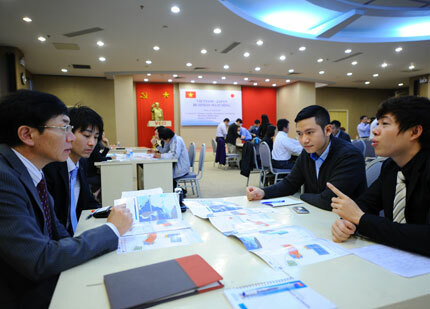 Many foreign investors were interested in Viet Nam's real estate projects, providing investment capital of billions of US dollars.